Thirty–one year-old Abdool Budhoo has been sentenced to serve 62 years in prison for the murder of two brothers, which occurred at Mackenzie, Linden, in September 2012. 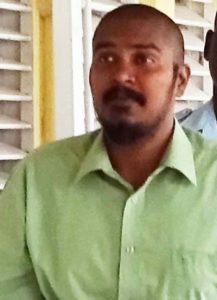 Budhoo, formerly of Industrial Area, Mackenzie, Linden, was convicted of murder and manslaughter in relation to the death of brothers, Shaheed and Imran Bacchus. Last month, he was found guilty of the two offences by a mixed jury at the Georgetown High Court. Reports indicated that the brothers were murdered as a result of a dispute over money at Wismar Street, Mackenzie, on September 30, 2012. On the day of the incident, an argument over outstanding monies had ensued between Budhoo and his cousin, Shaheed Bacchus, when Shaheed’s brother, Imran intervened. The brothers were fatally stabbed. During the trial, State Prosecutors Siand Dhurjon and Tuanna Hardy called a total of 11 witnesses to the stand. Budhoo was represented by defence counsel, Michael Somersall. Following the verdict, trial Judge Navindra Singh ordered a probation report for the accused. According to the report presented to the court yesterday, Budhoo was described as a quiet and peaceful individual, who came from a humble upbringing. He dropped out of school to work and help his mother provide for himself and his siblings. “He was the kind of person to help out in the home and assist his family. He hasn’t had the opportunity to raise a family of his own,” Somersall said begging the court for mercy on behalf of his client. Somersall noted that his client spent 53 months in prison pending the trial — he is only entitled to half an hour of freedom, each day. However, Prosecutor Siand Dhurjon noted that the crimes which Budhoo committed were very serious. But before he was sentenced, Budhoo stood up and told the court that he was sorry for the incident. In tears, he recalled that his cousin had thrown bricks at him when he was passing their home on the day of the incident. “I just wanted it to stop, but we had a fight, and before I know it he (my cousin) get stab,” the man mumbled. After listening to Budhoo, the Judge handed down the judgment. Justice Singh noted that while remorse is a factor to be considered when handing down a sentence, he could not be sure that Budhoo was genuine with his regret. “You started out by saying you are sorry, but then you gave a different version of the story than what was recounted by three eyewitnesses in the trial, so I really can’t say whether your remorse is genuine,” Justice Singh asserted. The judge calculated a sentence of 62 years in prison for the murder and 32 years in jail on the account of manslaughter. The sentences will run concurrently.